EcoLogic is a user-friendly, chip-based controller with a large display. 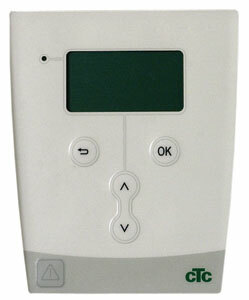 It controls heating with OTC using both outdoor and room sensors, and offers time programming. Room temperature can be easily increased or reduced manually. The Controller communicates with a heat pump bidirectionally and controls all its functions. Actual working values of the heat pump and the whole heating system can be displayed on the Controller. EcoLogic contains 12 preset basic heating systems, incl. an accumulation tank, DHW and pool heating. Even low-temperature heating systems with a mixing valve can be controlled (e.g. for floor or wall heating). Operation values are saved to a memory card continuously and can be reviewed later. The Controller can be controlled via SMS sent to a connected SMS Module. CTC EcoMiniEl is a small, external electric boiler designed to increase heating output in small steps when a heat pump’s output is not enough. CTC EcoMiniEl is fitted with 1“ inlet and outlet connections, with a small air vent valve and a mantle approved for pressure up to 5 bar. Remote Control makes it possible to control and display the same data as on the integrated controller in the el. boiler or on EcoLogic controller, just from your living room. It works with integrated heating units or with EcoLogic Controller. 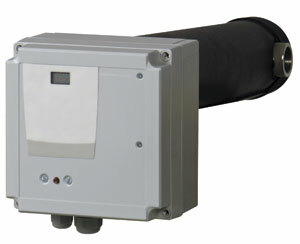 CTC EcoEl integrated heating unit contains everything needed for a domestic boiler room. Its compact size excels with little heat losses and occupies just a small space. 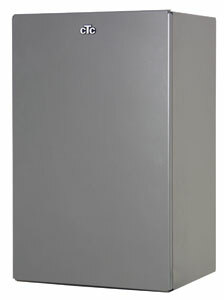 It has been designed for the best use of the heat supplied by the heat pump and for optimum operation. The user-friendly integrated intelligent regulator with a large display controls heating and domestic hot water for the whole house. Both indoor and outdoor sensors as well as communication with the heat pump are used for precise regulation and optimum operation. When needed, electric heating rods are gradually switched on in small steps. This way, the highest heating comfort is reached together with energy savings. Of course, also solar collectors or a solid-fuel boiler can be connected. The controller is equipped with current sensors for the main fuse, so it is able to reduce immediately the power drawn for heating. Thanks to this fact, the controller will prevent the main fuse tripping, e.g. hen an electric stove or a water well pump starts, however, this short heating interruption will not affect your home comfort in any way. This function enables that electricity is used for heating even in houses with a low-sized main fuse. 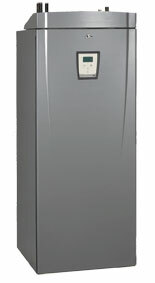 EcoEl will take care of comfort heating and ample supply of hot water. This is an EcoEl electric boiler amended with an integrated solar module and a heat plate exchanger. EcoCool is designed to be installed together with EcoPart ground-source heat pumps or with an integrated heating unit containing EcoHeat ground-source heat pump. In the summer, cold from the bore can be used for cooling through underfloor heating systems or fan convectors (not for current domestic radiators). Either passive cooling is available, using the cold from the bore while the heat pump is off, or active cooling with a heat pump for a higher cooling output can be used. In both these cases the bore receives and stores heat for the next winter. 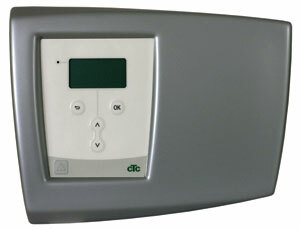 Its integrated control unit communicates with a heat pump and EcoLogic Controller. The desired room temperature can be kept with max. use of passive cooling. It needs very little electric energy, namely for circulation pumps only, and reduces one’s cooling expenses to minimum. SMS module is designed for remote communication with a heat pump using SMS text messages. With a plain SIM card inserted, the module can send you info concerning the heat pump and temperatures measured by the controller. You can change the room temperature, reset alarms etc. 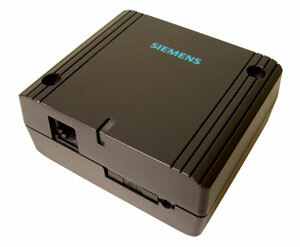 This SMS module connects either to an EcoLogic Controller or to integrated heating units with a built-in controller.